The building is based on the U.S. Capitol building in Washington, D.C. The west facade ends in projecting bays, and a portico projects from the center of the building. At the base of the portico, seven granite archways brace and support the porch above. Eight fluted Corinthian columns line the portico. A cornice supports the pediment above depicting Minerva surrounded by Education, Justice, Industry and Mining. Above the flat roof with balustrade are two drums supporting a dome. The first drum consists of a colonnade of Corinthian columns; the second, Corinthian pilasters. Large arched windows line the drum walls. The dome is 64 m (210 ft) high, and supports a lantern with a smaller dome capped with a gold-leafed orbed finial. The Latin phrase "Senatoris est civitatis libertatem tueri" ["It is the duty of a Senator to protect the liberty of the people"] lines the cornice. A portrait of George Washington by Jane Stuart, the daughter of Gilbert Stuart, is on the wall above. The State Seal hangs above. Statues of the Roman goddess Minerva once overlooked both chambers. Today, Minerva, sculpted by Michael H. Casey, appears only in the senate chambers. Gilded Corinthian columns support the gallery above, and dark red curtains that can be drawn for privacy are tied back along the columns. High arched windows run along the bottom below rectangular pane windows. Behind the rostrum, there are two chairs with red velvet cushions, reserved for the president pro tempore of the senate and the speaker of the assembly, but are never used. The California Assembly chamber is located at the opposite end of the building. Its green tones are based on those of the British House of Commons, the lower house. The dais rests along a wall shaped like an "E", with the central projection housing the rostrum. Along the cornice appears a quotation from Abraham Lincoln[ citation needed] in Latin: legislatorum est justas leges condere ("It is the duty of legislators to pass just laws"). Almost every decorating element is identical to the Senate Chamber. The capitol's grounds are known as Capitol Park, an area of 10 undivided city blocks running from 10th to 16th and from L to N Streets. The entire Capitol Park area is included in the National Register historic district listing. The park is managed by the California State Capitol Museum. The State Capitol houses the office of the Governor of California. ^ "California State Capitol". SkyscraperPage. 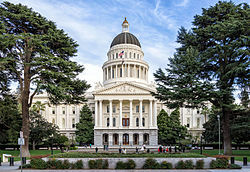 ^ "California State Capitol". Office of Historic Preservation, California State Parks. Retrieved 2012-10-11. ^ "California Landmark 872: State Capitol Complex in Sacramento, California:". Noehill. 2010. Retrieved 29 September 2010. ^ "More Terrestrial Chills – Sacramento Shivers Again, But Not Damaged to Any Extent". The Sacramento Union. April 22, 1892. p. 3. "The Capitol was given a lively shaking, in the course of which a small portion of one of the plaster statuettes tumbled off and the Assembly chamber ceiling cracked. Of course, there was a general exodus of State officials and clerks, too." 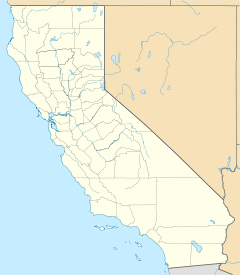 Wikimedia Commons has media related to California State Capitol. § - Removed but formerly an NRHP listing. † - Shared between Yolo and Sacramento Counties.